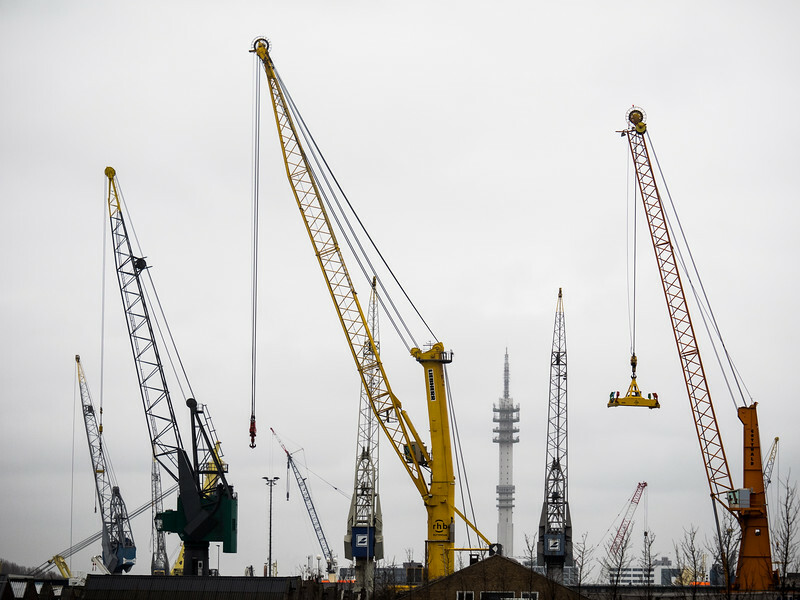 Rotterdam was almost completely destroyed by German bombing during the Second World War, and as a consequence had to be rebuilt from scratch. With its huge port and modern buildings it’s always had something of a gritty reputation but in recent years it’s been reinventing itself (not unlike Belfast) with some stunning modern architecture, art installations and galleries. 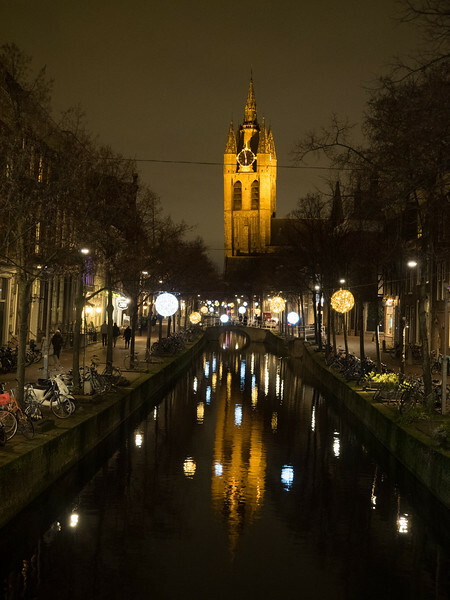 I travelled from London on the Eurostar and spent four days exploring the city. 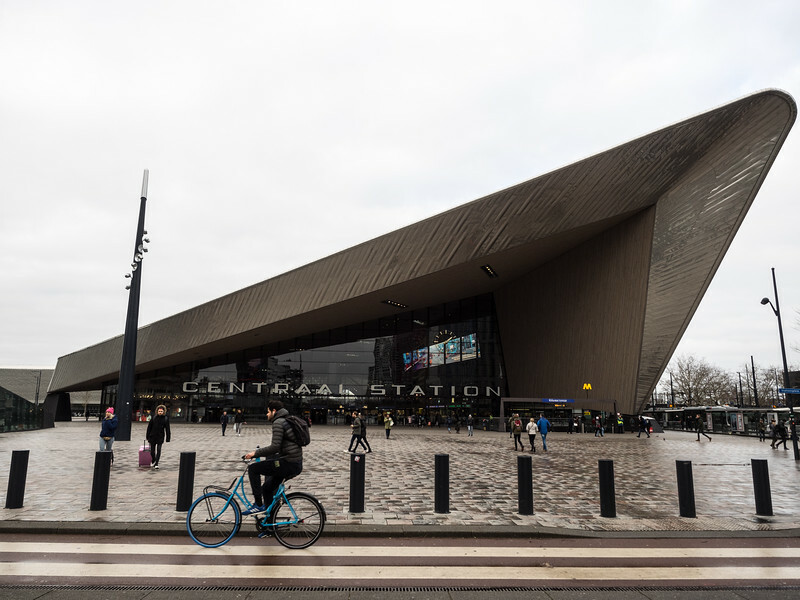 The determinedly-modern Central Station in Rotterdam, which opened in 2014. I arrived here on the Eurostar from London, a three hour journey, and was literally staying across the road so it was incredibly handy. I had a charming view into the boardroom of the adjacent office block - this area is quite built up. 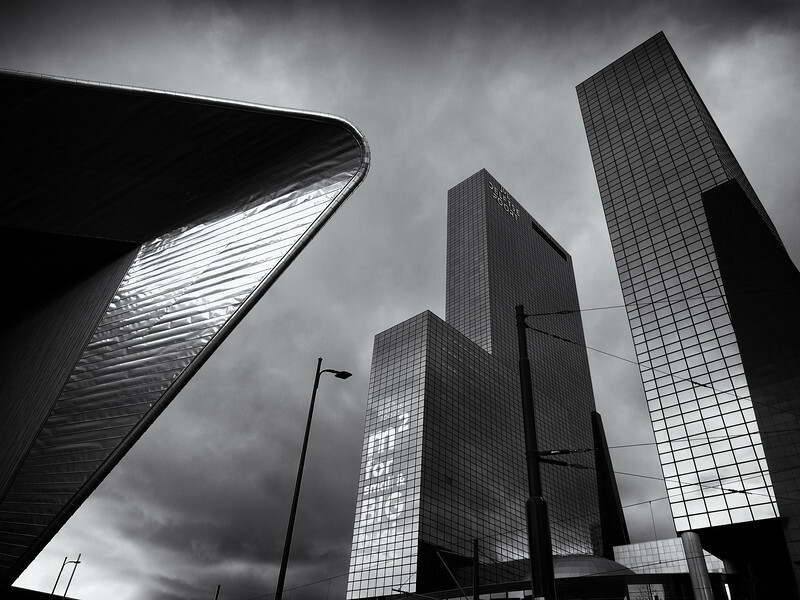 The central part of Rotterdam has lots of dramatic modern architecture like this. The metal projection on the left is the edge of the new Central Station. 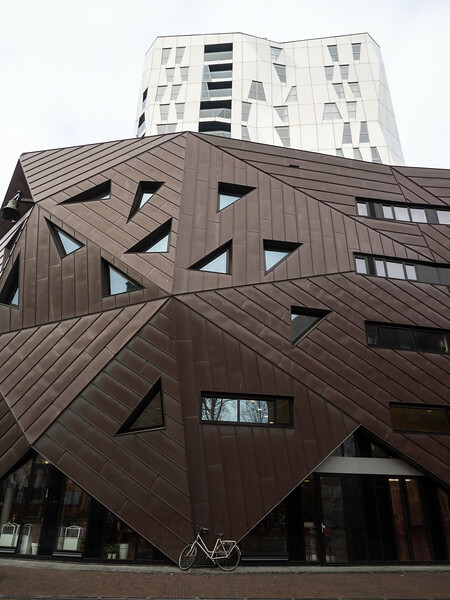 There’s lots of of crazy architecture like this in the city. I kept thinking there was something wrong with my eyes. The building at the bottom is actually some kind of church. 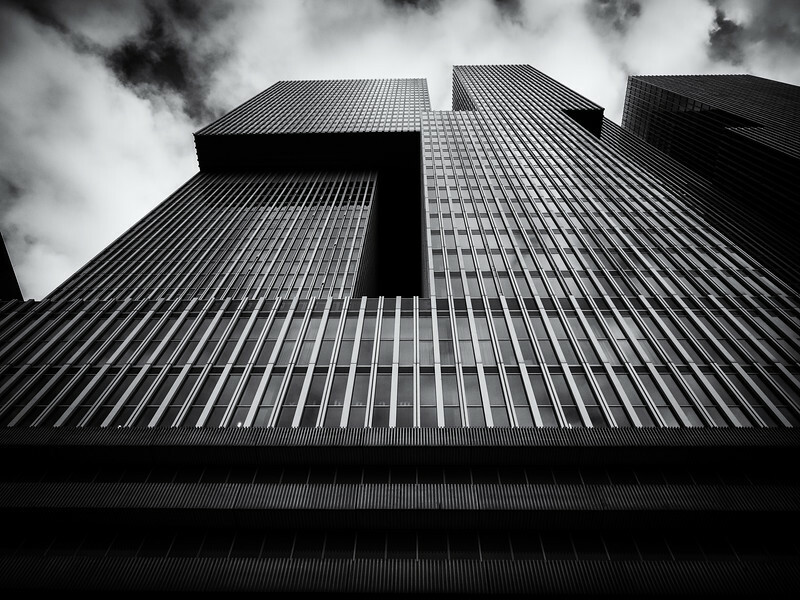 The fantastically stark De Rotterdam building, which opened in 2013. It reminded me of a game of Tetris, or Lego bricks. 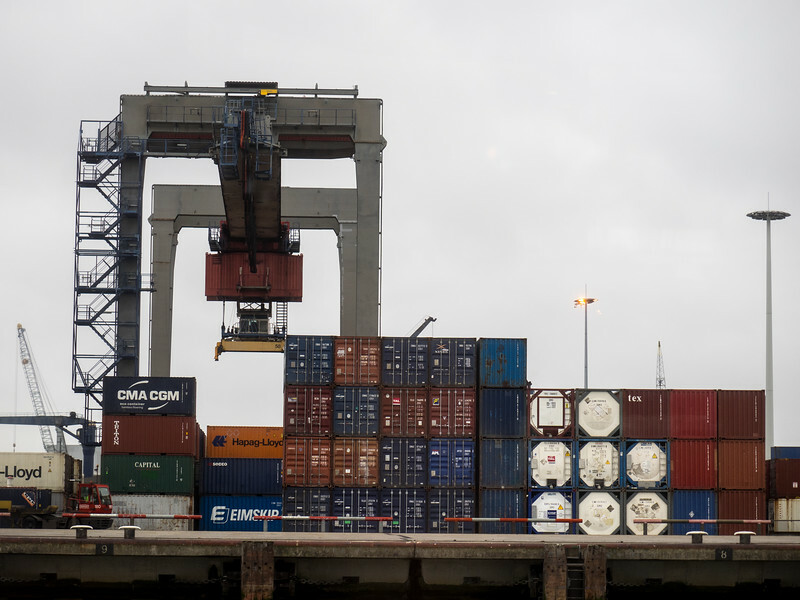 Lots of container ships sail up and down the river. 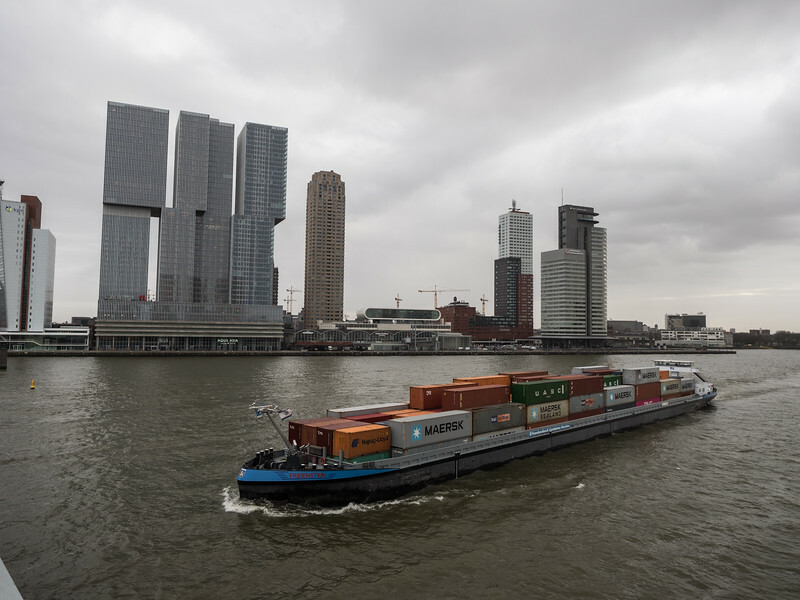 Rotterdam is the busiest port in Europe (and a few years back it was the busiest in the world, before being overtaken by Singapore and Shanghai). 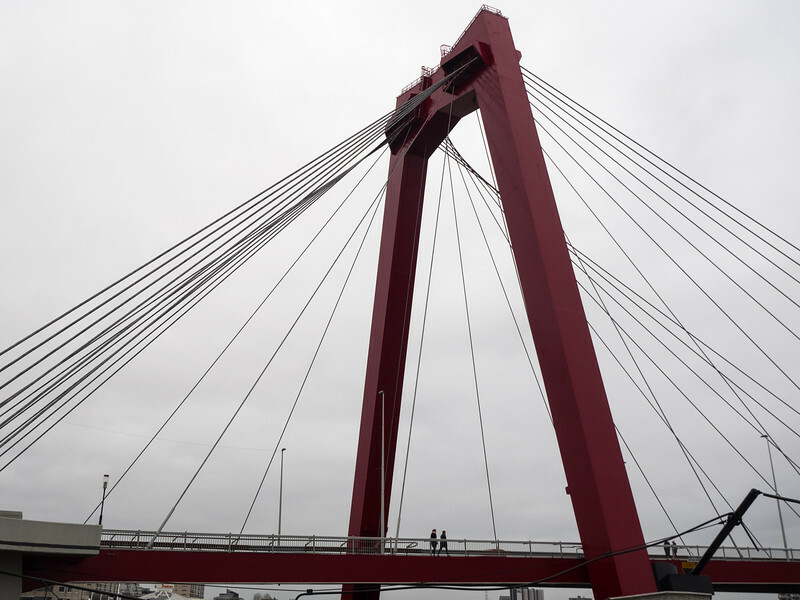 This is a viewpoint from below De Rotterdam, looking up. 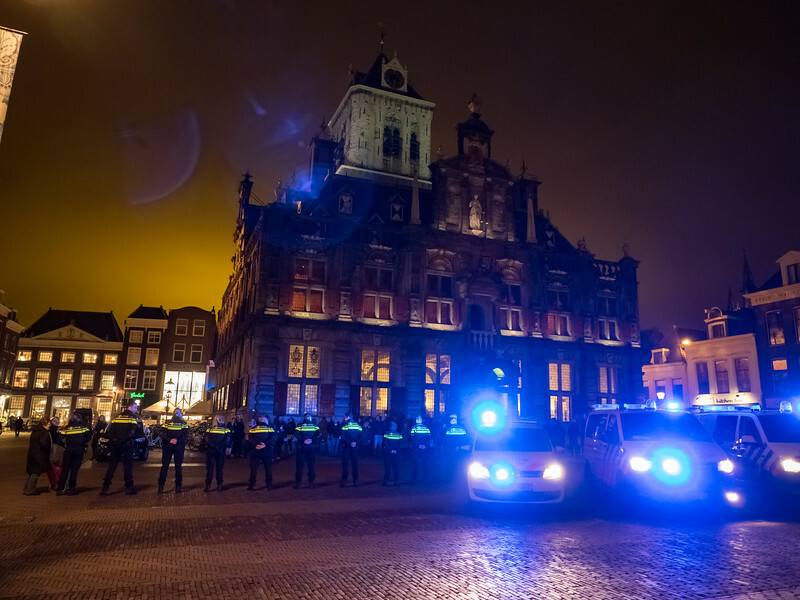 It really is like something from a sci-fi film. 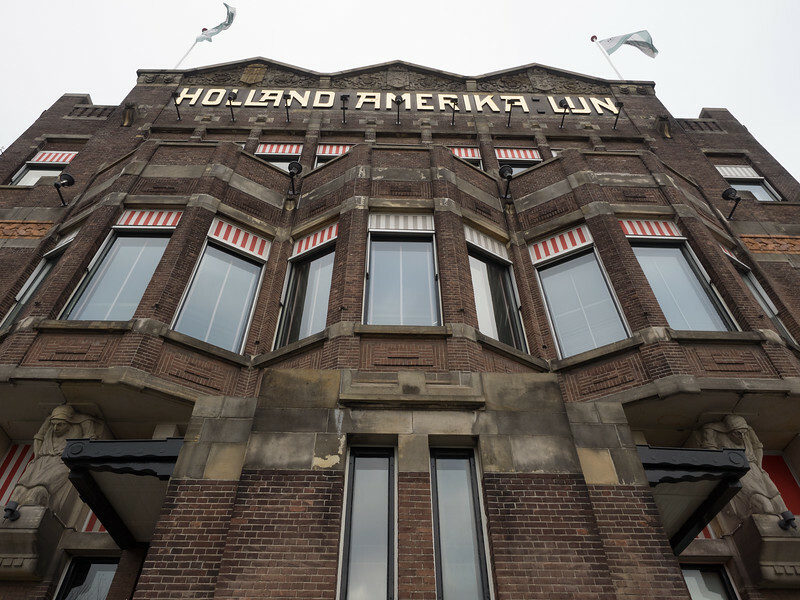 Hotel New York is in the building that used to the main office of the Holland America shipping company. Thousands of migrants boarded ships here to sail to North America. 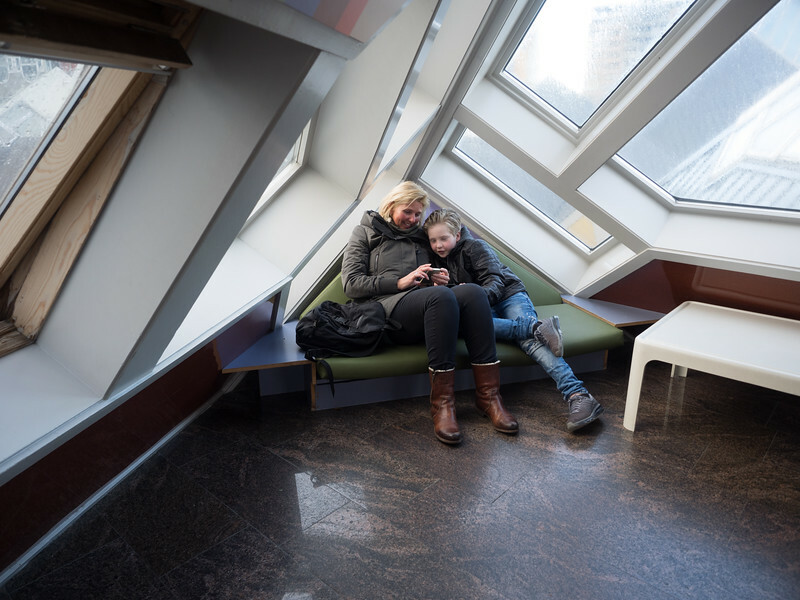 Photographs by the Dutch photographer Cas Oorthuys, in an exhibition at the Nederlands Fotomuseum. 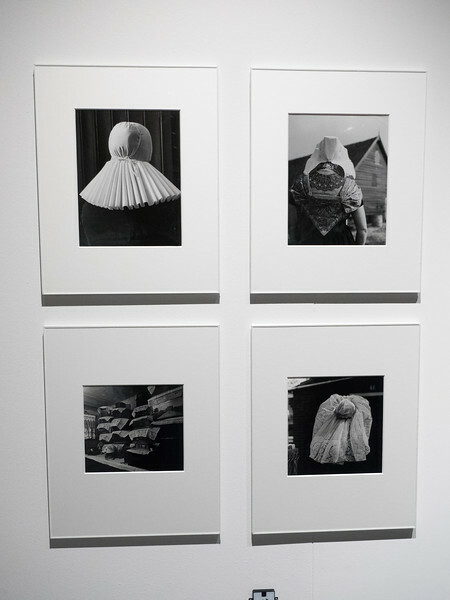 I’d never heard of him before but I was really impressed by his work (and such an interesting life - he’d worked for the Dutch resistance during the war, photographing the German occupation). 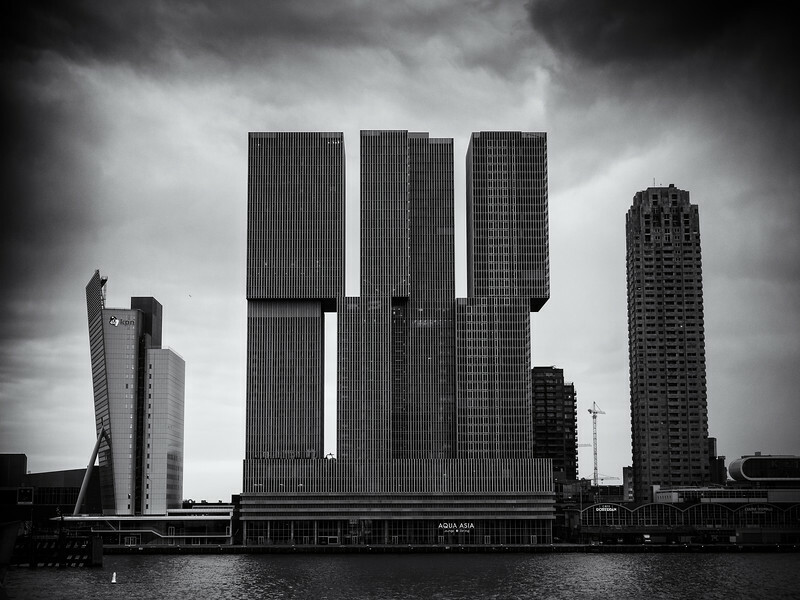 More futuristic architecture near De Rotterdam. In this area by the river you have an interesting combination of skyscrapers and big open skies. 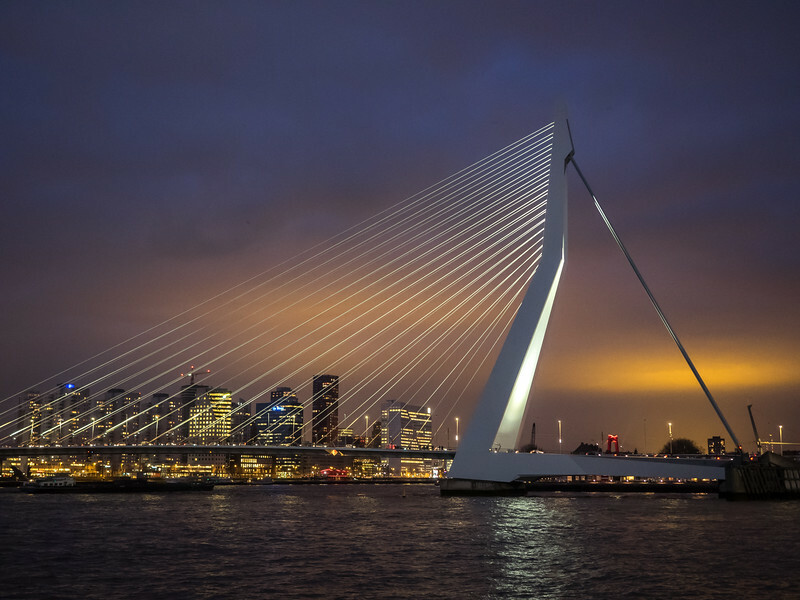 The beautifully elegant and ethereal Erasmus bridge, completed in 1996. It's supposed to resemble a swan. At night it looked absolutely beautiful. 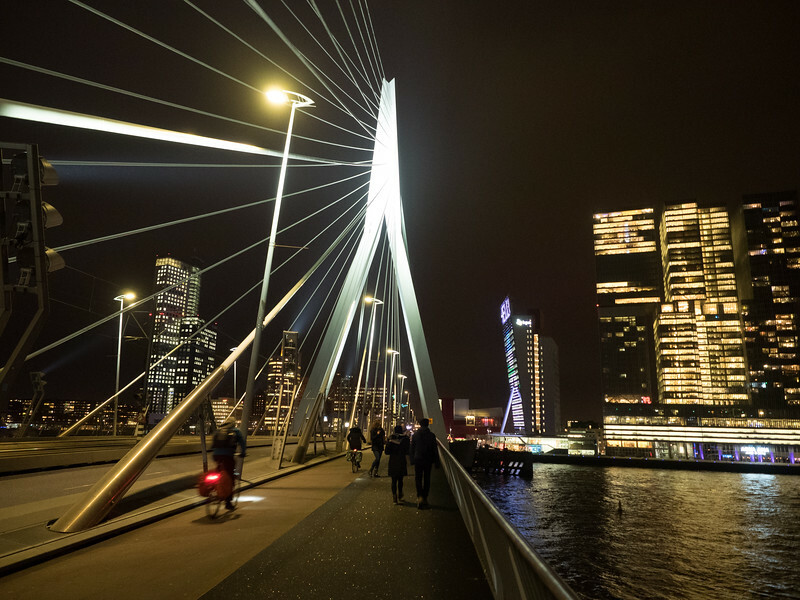 Crossing the Erasmus bridge at night. 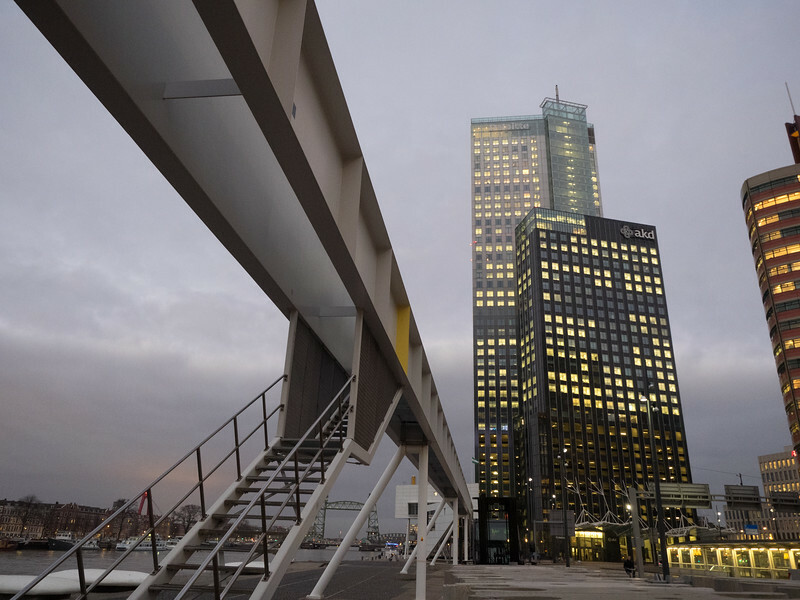 The De Rotterdam building is on the right. 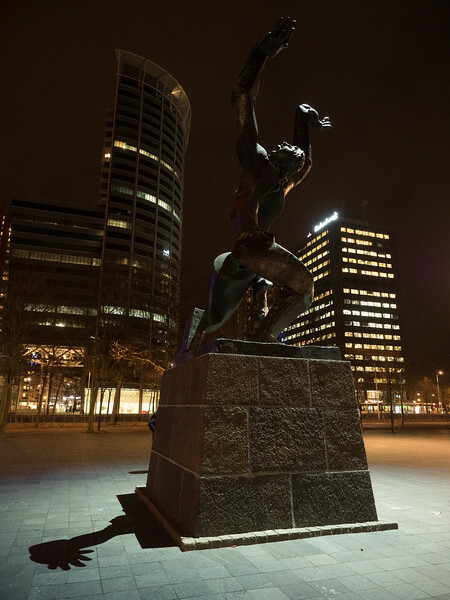 This statue, The Destroyed City, commemorates the destruction of Rotterdam in 1940 by German bombing. The central part of the city was almost completely leveled. 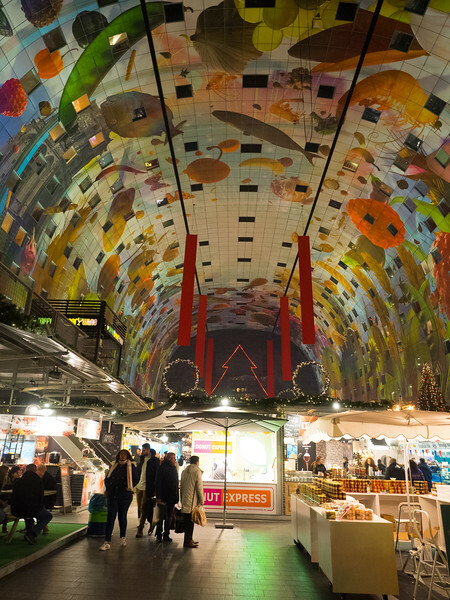 Rotterdam’s Markthal (Market Hall) , which opened in 2014 (you can see how many of the city’s iconic buildings were constructed in recent years). The central bit has lots of market stalls, cafes and restaurants. 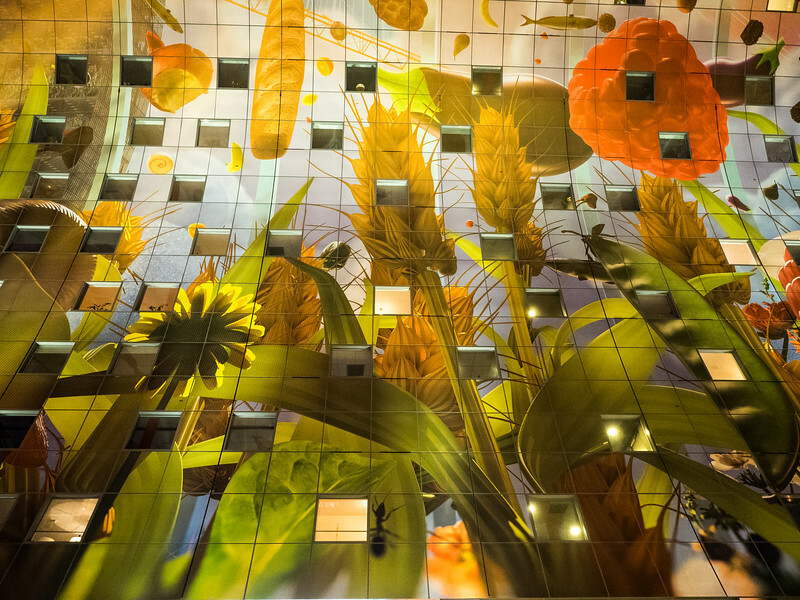 Looking up at the ceiling of Markthal, decorated with huge paintings of agricultural produce. 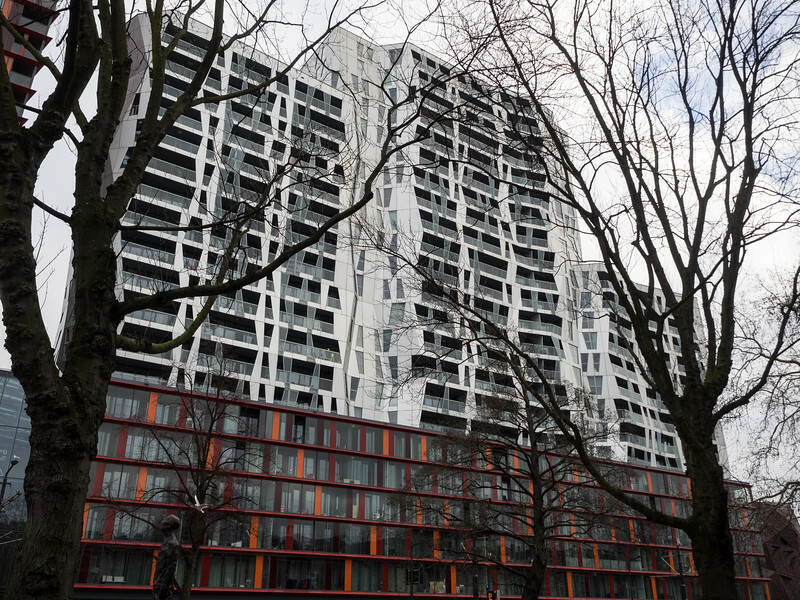 The windows are actually into people’s apartments, built into the sides of the building. 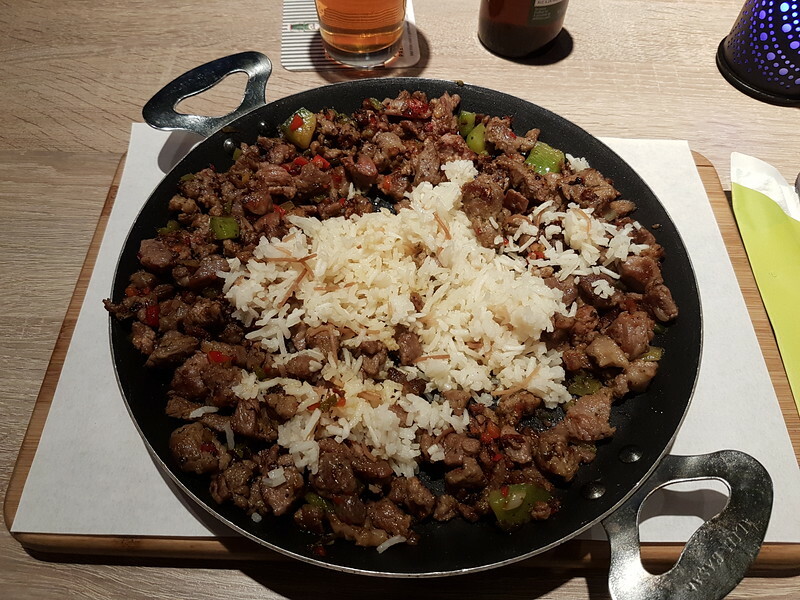 This spicy lamb dish in the Markthal was delicious and very substantial; I could hardly eat it all. 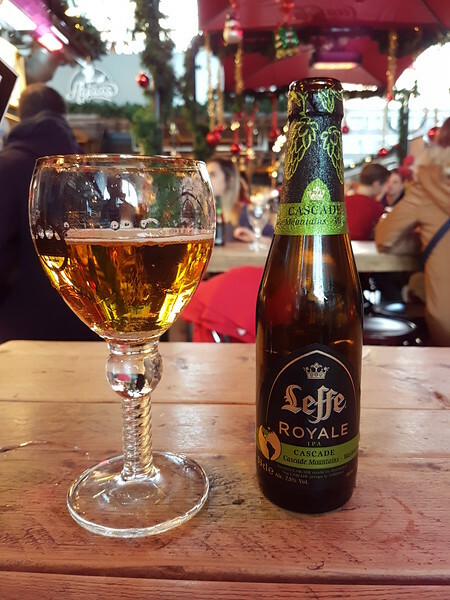 A nice beer and an even nicer glass. 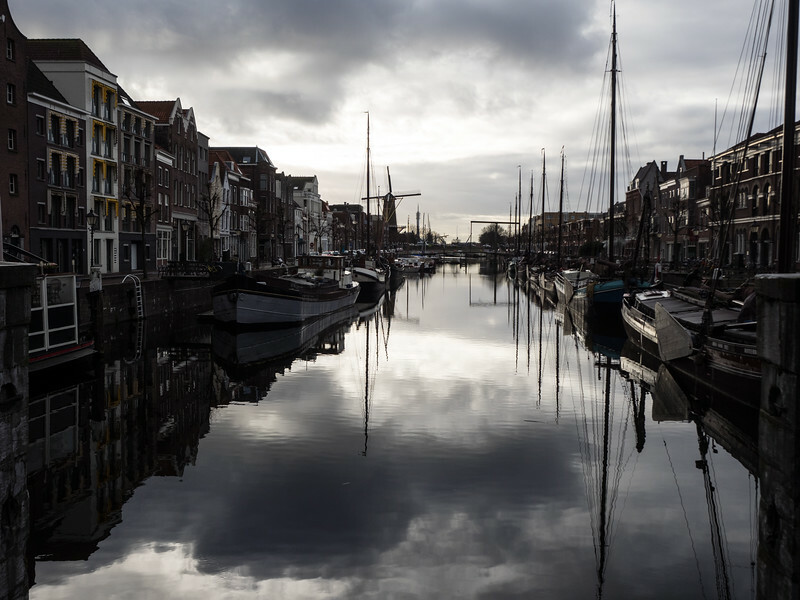 Delfshaven is one of the few area of Rotterdam that survived bombing during the war, and it still retains its original character. The Pilgrim Fathers sailed from here in 1620 on the Speedwell, later transferring in England to the Mayflower. 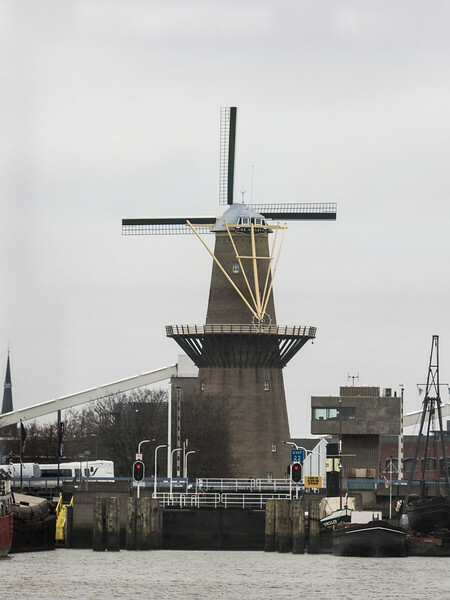 The harbour at Delfshaven, looking up towards an old windmill. 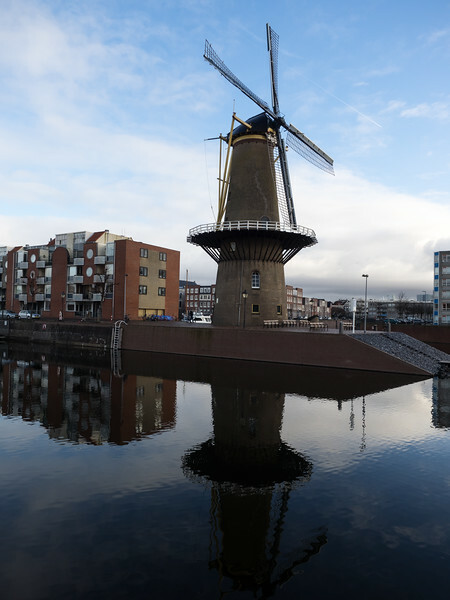 A real surviving windmill at Delfshaven. 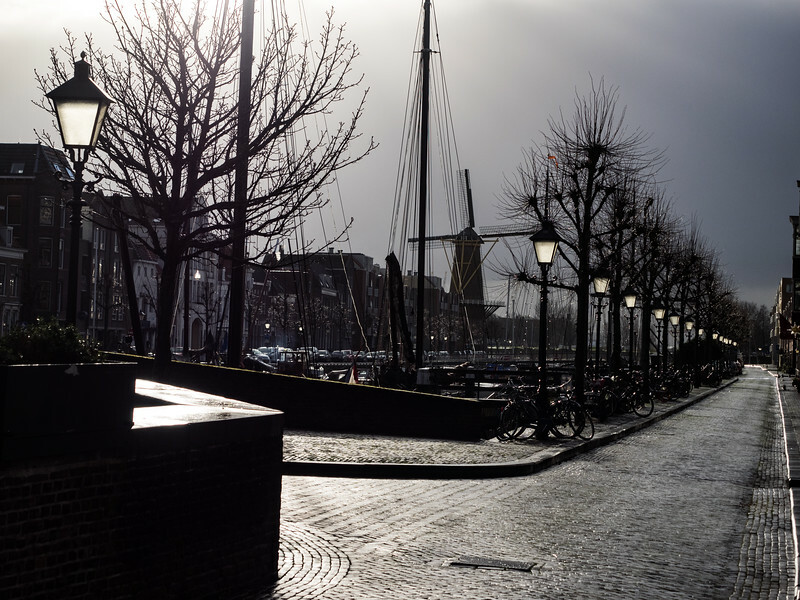 The weather while I was in Rotterdam was generally very overcast but in Delfshaven the sun came out (briefly). The street lamps looked like they were turned on, with the sunlight shining through them. 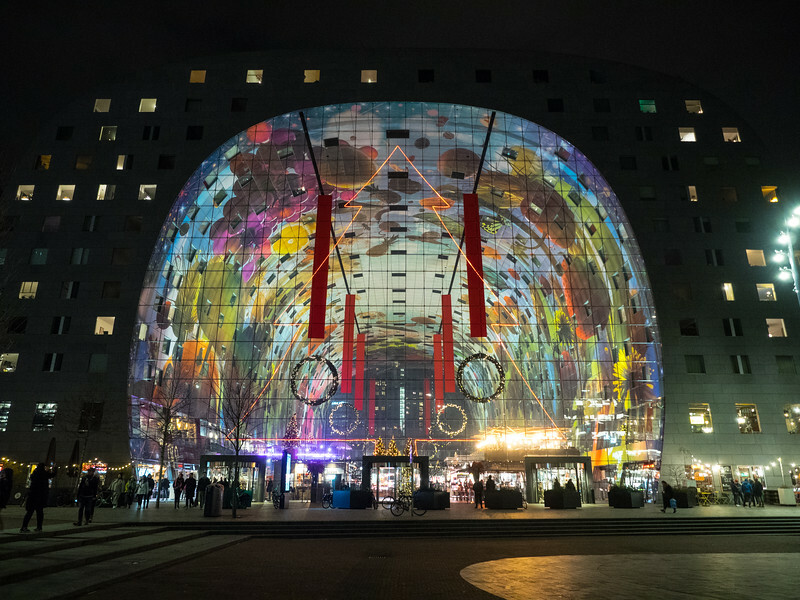 Rotterdam has lots of interesting street art. 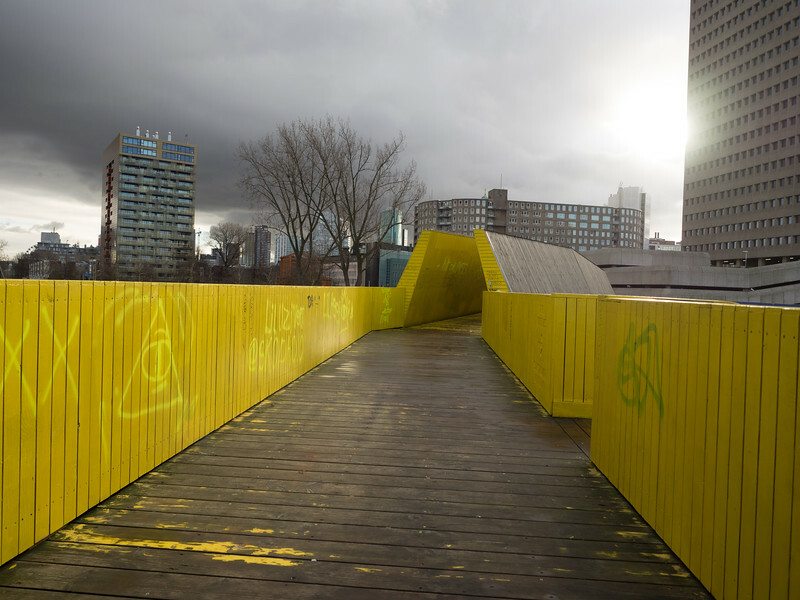 The Luchtsingel ("air canal") elevated walkway was constructed to revitalise a rundown part of central Rotterdam, and connect together several areas of the city. 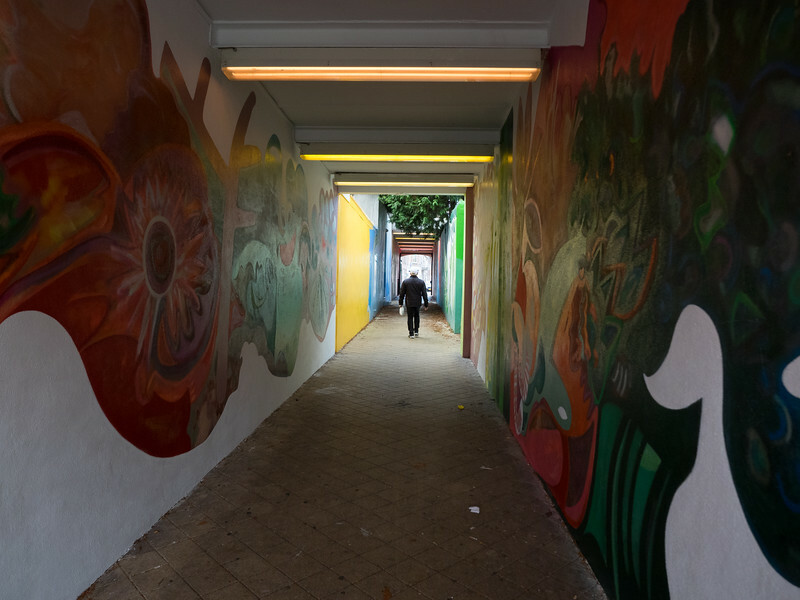 It brings a welcome splash of colour to an otherwise grey part of the city and is much-beloved of Instagrammers, for obvious reasons. 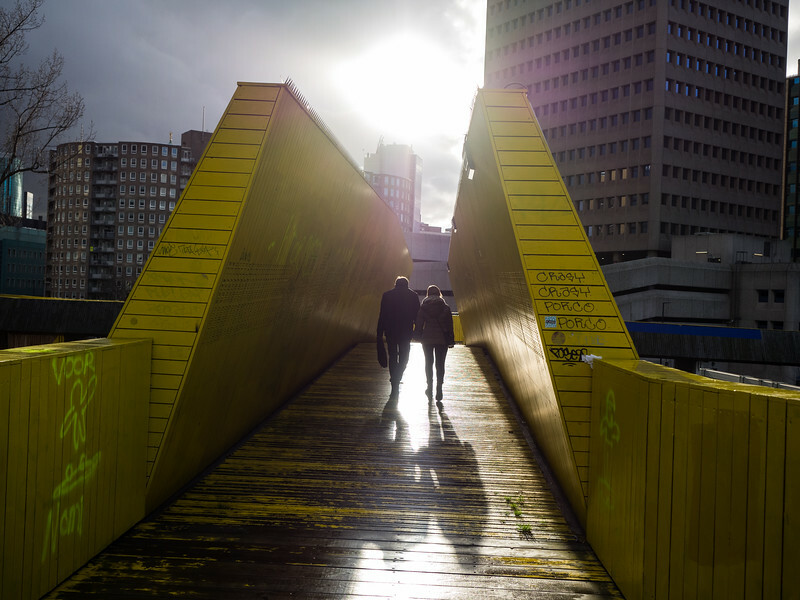 Walking along the Luchtsingel into the afternoon sunshine. 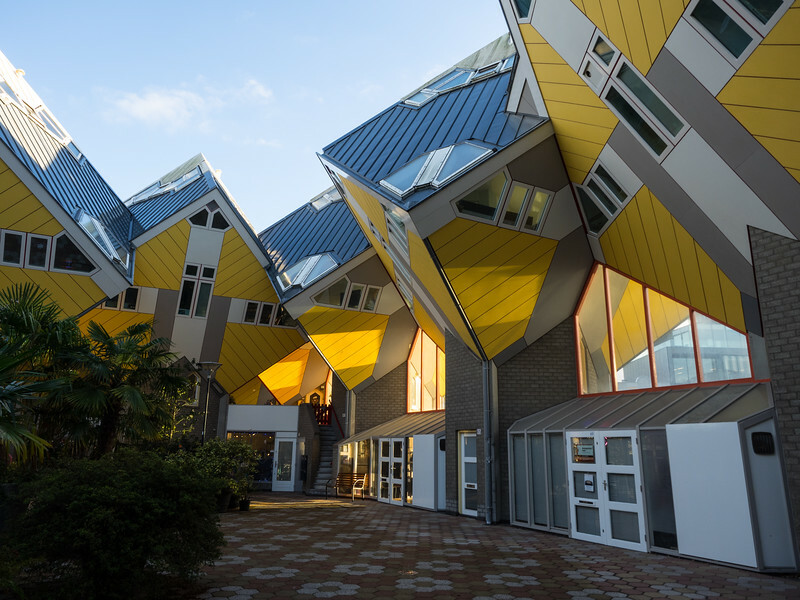 The fantastically-odd Cube Houses, designed by architect Piet Blom in the 1970s. Looking at them from below it’s hard to imagine that people actually live in them, but they do - though they must get completely tortured by the hordes of tourists like myself coming to gawk at their homes. Inside one of the cube houses (this one is open to tourists) - they’re suprisingly roomy inside, spread over three floors. This is the top level, which is pleasantly bright. Looking up from below some of the cube houses. 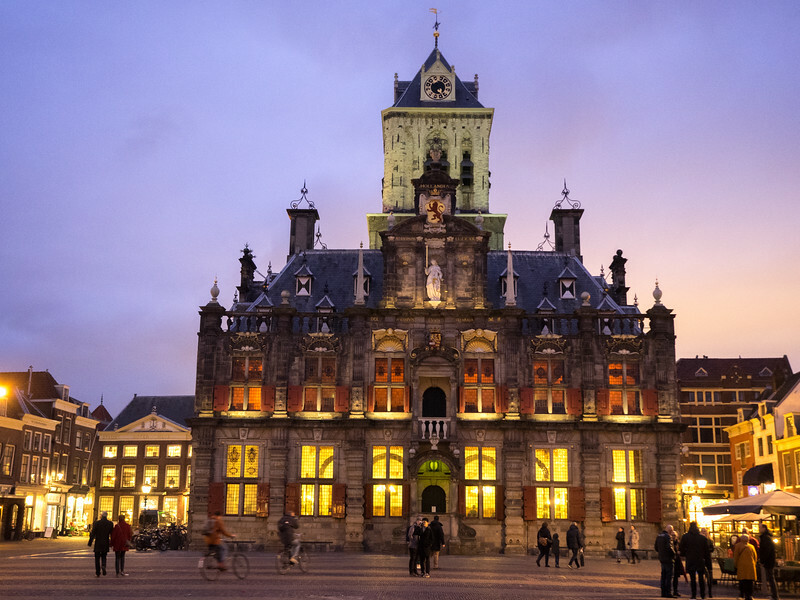 The city of Delft, famous for its pottery, is only 10 minutes away from Rotterdam by train. 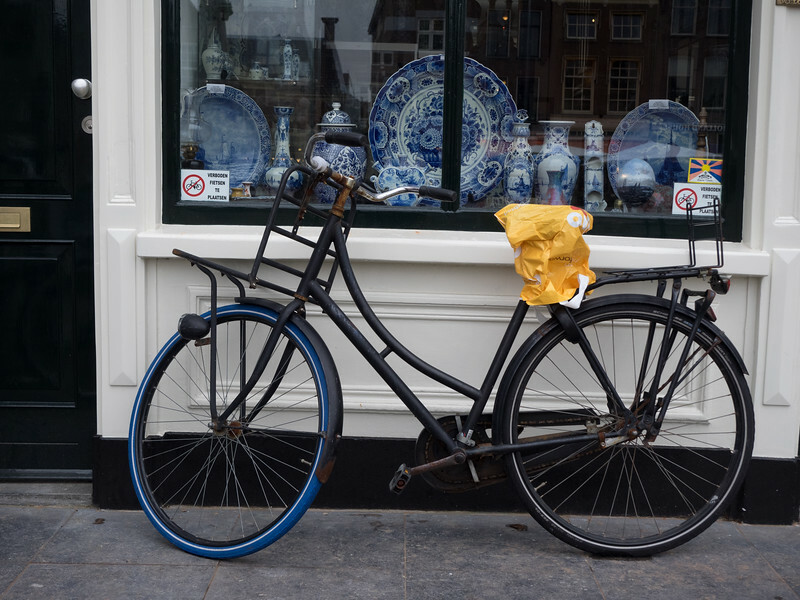 You can see some antique examples of Delftware in the shop window here (I also like the way the person who left the bicycle is completely ignoring the signs). 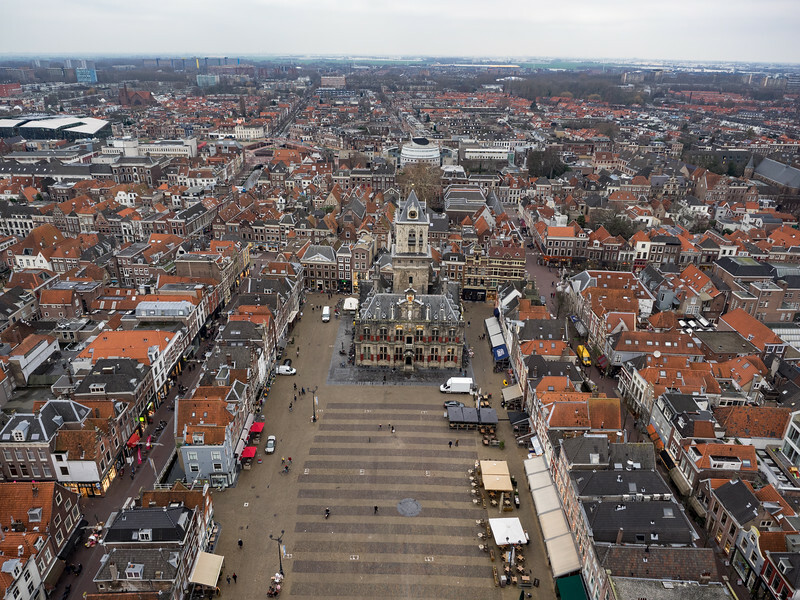 There are two potteries still in Delft making the traditional pottery (most of the stuff in the shops is mass-produced in China). 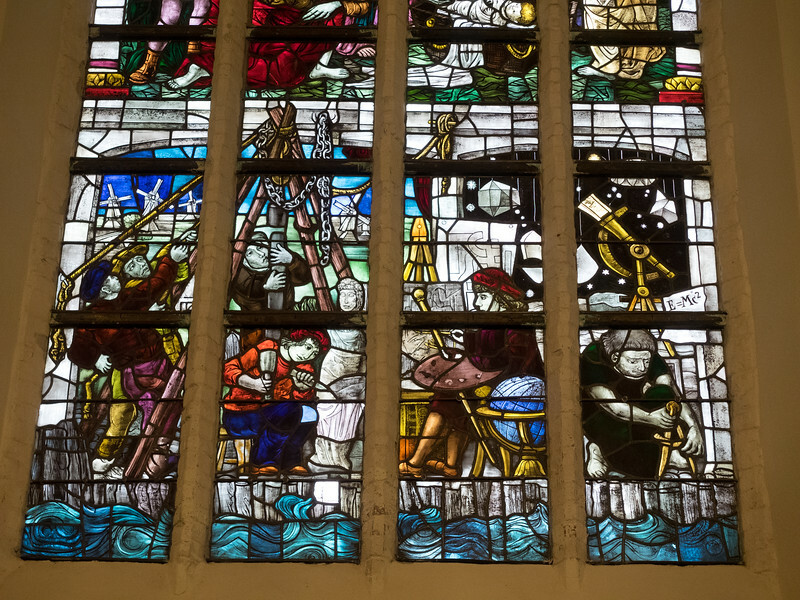 I visited one, De Delftse Pauw, and got a tour around the factory (and bought a traditional Delftware blue and white tile, which I'm not quite sure what to do with). 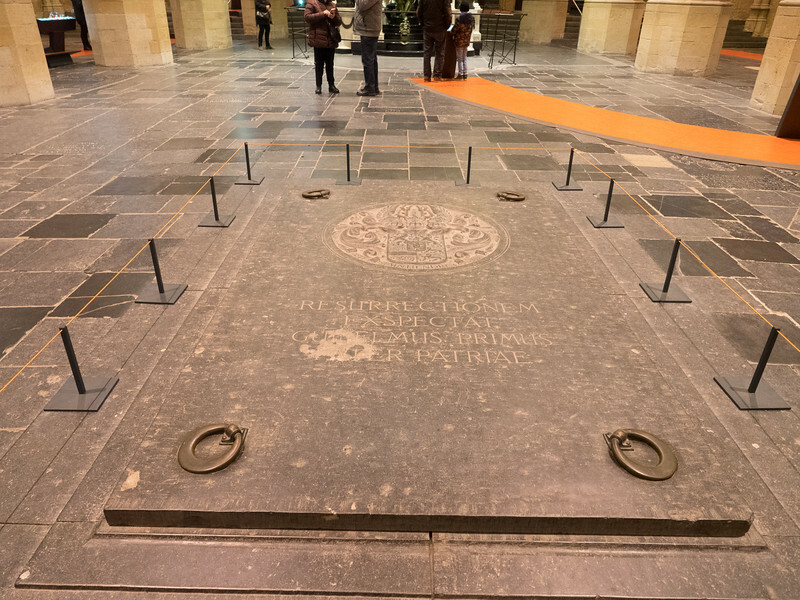 This massive slab covers the entrance to the crypt where all the Dutch royal family are buried. 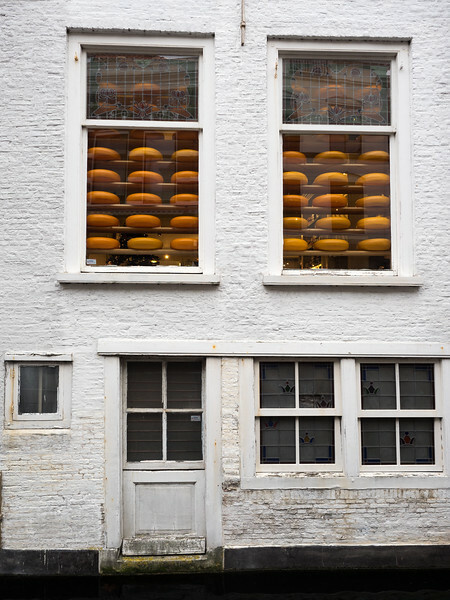 The back of a cheese shop in Delft, looking on to a canal. 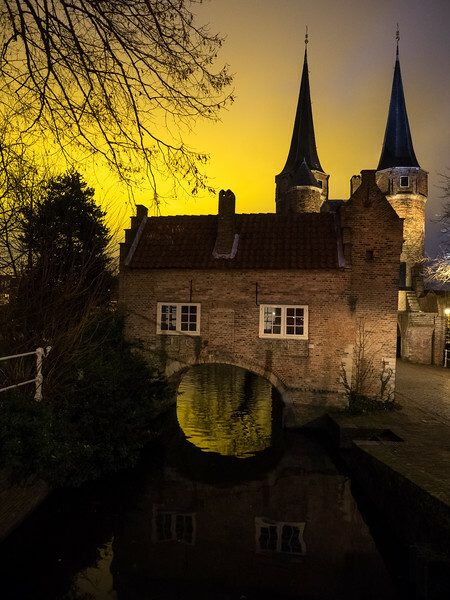 The town has a network of cute little canals. 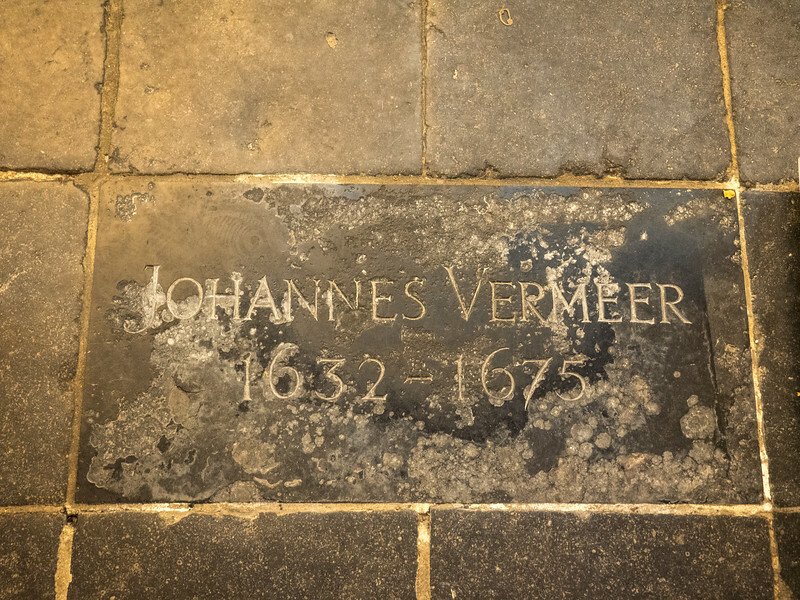 The burial place of Vermeer in the Old Church in Delft. He lived his entire life here and died pretty much in poverty, his brilliance only being recognised many years later. Stained glass windows in the Old Church - spot the modern addition on the right! The current windows were actually installed in the 1960s, I think. 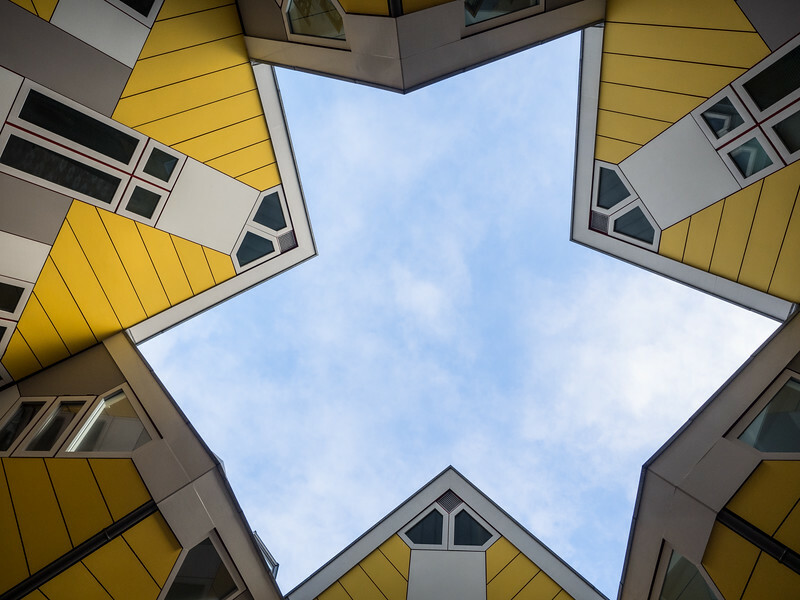 I spotted this very peculiar house while walking down a street towards Oostpoort. 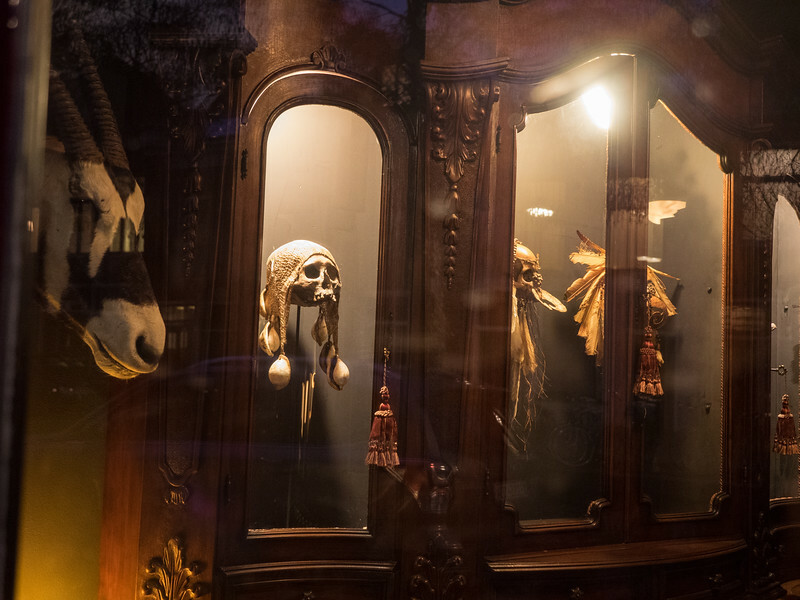 It seemed to be a residential house - there was a cat fast asleep on an armchair below the window - but the contents were, to put it mildly, a little unsettling. 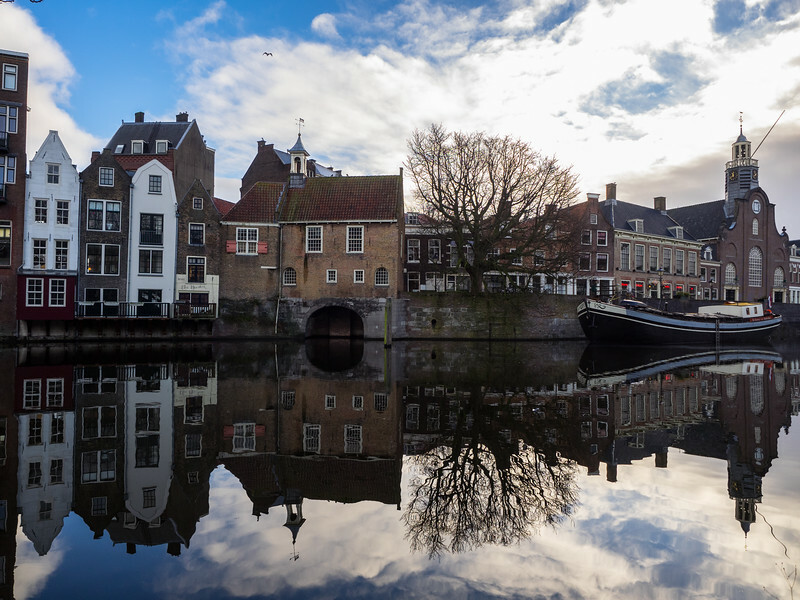 Reflections in one of Delft’s many canals. 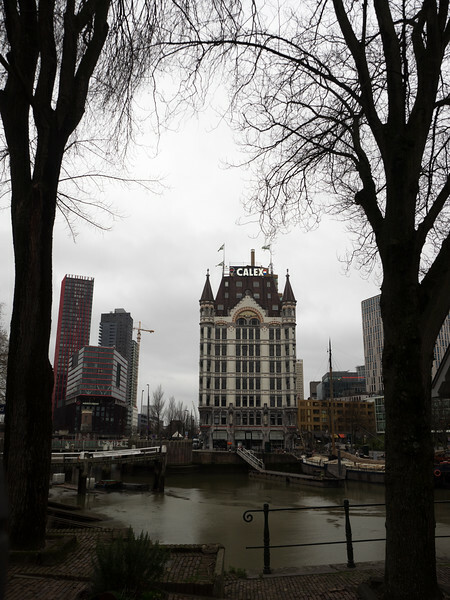 Back in Rotterdam, this is the Witte Huis (White House) in the old harbour area. When it was built in 1898 it was the tallest building in Europe, at 10 storeys. You actually do see quite a lot of windmills in Holland, it's not just a stereotype. 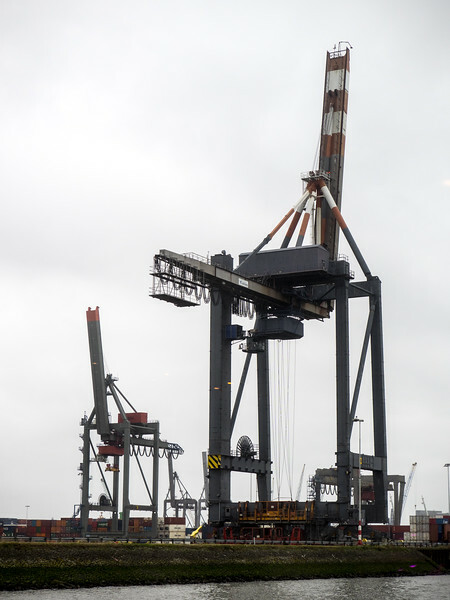 On my final day in Rotterdam I did a fascinating 90 minute boat tour of the port. The boat was great, too - there was a little cafe so you could sit with a coffee and food (I had a slice of a traditional apple tart) and watch the endless activities in the port. 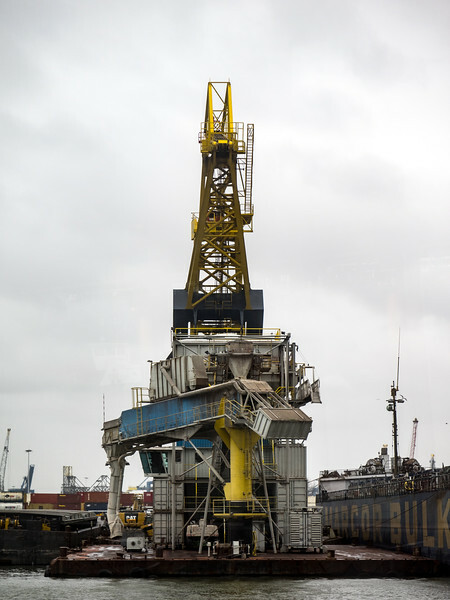 Initially I stayed inside on the boat (it was freezing on deck) but on the return leg I went outside and it was completely exhilarating. Not sure what this does but it looks complicated. 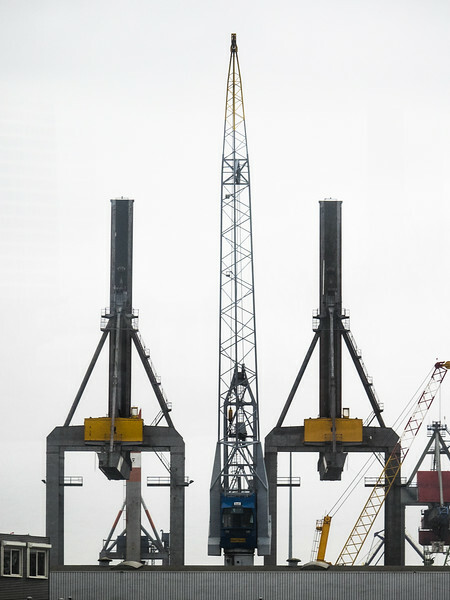 Lots of cranes in the port. 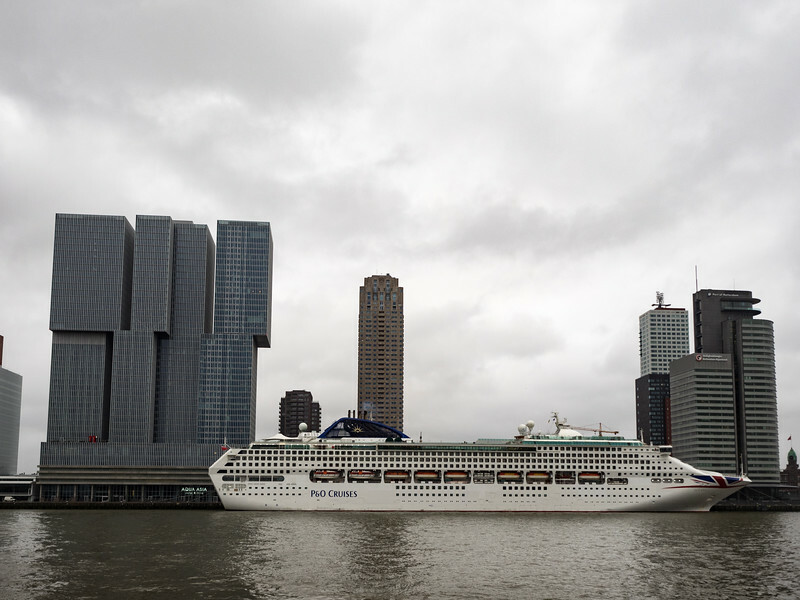 This cruise liner made an interesting juxtaposition with the De Rotterdam building.